Large 56-oz. glass blender jar. 7-speed touchpad controls with LED indicators: Off, On, Pulse, Stir, Chop, Mix, Purée, Liquefy and Ice Crush. All removable parts are dishwasher-safe. 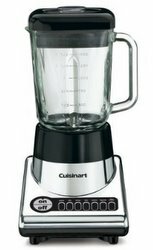 Stars Based on actual user experience and reviews, this blender is RATED LOWER THAN AVERAGE by 14 USERS and ranks in the BOTTOM 4% of all blenders. 30% of users rate this blender favorably. You must press 2 buttons to make it go. Every time. Very frustrating. It does not have enough power. It's difficult to clean compared to the Kitchenaid. It's painted plastic. It's not chrome. For the money, it is just not worth it. It's the heavy duty work horse I only dreamed about, can't thank you enough. Do not be deceived by the 56 ounce container, there is not enough power in the motor to puree that much product. The blender will work OK if you only fill the container about 1/3 of the way full, but then what's the point of paying extra for this large capacity? Buy it and you'll love it too. It did a great job blending a smoothie, but it smelled like burning plastic with the first use and stopped working completely during the 3rd use.